Buy, Rent or Skip 2012? I do believe that Roland Emmerich made 2012 as an apology letter for dropping the ball with The Day After Tomorrow which was very underwhelming to say the least. On the recommendation of Mac, I decided to give 2012 a shot...to give Roland a chance to redeem himself in my eyes. Boy, did he ever deliver on that promise. THIS is exactly what I was expecting from The Day After Tomorrow. 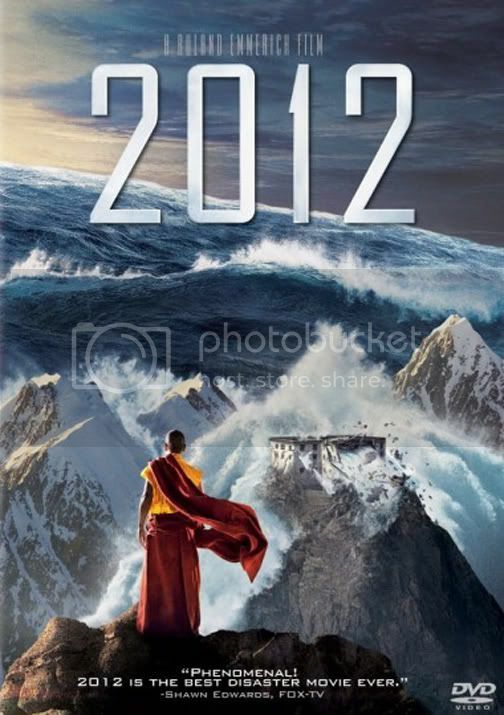 Let's be clear what 2012 is meant to be...a mindless, escapist fun, popcorn flix to entertain the masses. The Special FX were absolutely amazing. Stunning is more like it. Pretty much the entire length of the movie had my heart racing from adrenaline rush. This is an E Ticket thrill ride and it was a blast. But there was actually more to the movie that I liked as well. For starters, I liked pretty much all the characters in the film which I didn't with the other and that's one of the reasons why it failed in my eyes. In 2012, if you like the main characters and his family and show the viewer that they have faults and are trying to mend fences, you're gonna care about how they get there. I really like John Cusack and Danny Glover. Thandie Newton is always good on the eyes. Yowzza! They manage to cast someone in the role of "resident dipsh*t" perfectly with Oliver Platt. Man, I wanted to punch that guy in the face big time. People may say this movie is stupid and that's fine. Maybe it is. Personally I could care less what they say if the end results gives me an entertaining 2 hour thrill ride. This is definitely a Buy for me because I can see myself watching this one multiple times in the future, and that's saying a lot given the fact that any movie that shows California slipping into the Pacific Ocean is unsettling for me to witness. I may actually watch this again tomorrow!! Entertainment Weekly announced that there was a plan for a spin-off television series entitled 2013 that would have served as a follow-up to the film. Executive producer of 2012, Mark Gordon told EW that "ABC will have an opening in their disaster-related programming after Lost ends, so people would be interested in this topic on a weekly basis. There's hope for the world despite the magnitude of the 2012 disaster as seen in the film. After the movie, there are some people who survive and the question is how will these survivors build a new world and what will it look like. That might make an interesting TV series." This sounds interesting and something I'd actually get on board with because I tend to enjoy post-apocalyptic series and films. Remains to be seen if this comes to fruition. The above quote sounds like it's a couple of years old, like it was suppose to follow immediately in the footsteps of LOST. Roland Emmerich, IMO, has been involved with some of the better entertaining movies out there. Entertain me damnit and Roland does well. I liked Godzilla. I liked Eight Legged Freaks. Independence Day is in my top 5 movies of all time. Patriot, quite the departure is still a fun film. Day After Tommorrow is fun. 10,000 BC is OK, but not bad. Everything doesn’t have to be Oscar. In fact I shy away from ‘Oscar’ contenders. Anytime 2012 is on, I will stop what I’m doing and watch.